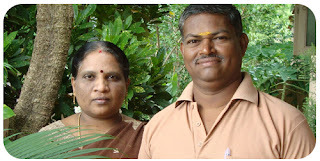 When M. Murugan (51) starts from his house in the morning, his wife Umaa Murugan gives him two packets of food every day. For the past 24 years, before taking his lunch for the day, Murugan ensures that one poor person is also fed. Murugan, popularly known as Aum Murugan, is presently working in Southern Railway and spends one-fourth of his salary for the social cause, with the full support of his family members. Through 7 centres of Aum Education Seva Trust, he provides vocational training to nearly 3000 poor people annually free of cost in the neighbouring districts of Chennai. Besides, every year he conducts 100 eye camps and health camps with the help of Sankara Nethrayala covering 40 villages and 10,000 beneficiaries annually. Since 2004, he has done more than 700 such camps, which benefitted more than 50,000 poor people. Besides his personal contribution of his salary, he also gets the support from friends and well wishers. In the past four years, he has also distributed 40,000 CDs/DVDs free of cost to various Government Schools, to enable the secondary and senior secondary children to learn the subjects on visual and animation techniques. Born in a very poor family in Kanyakumari District, he lost his father before his first birthday. His mother Amaravathy struggled hard to bring up her two sons and one daughter, by undertaking various household jobs. Murugan, being the youngest, came to Chennai at the age of 13 along with his mother. His elder brother Sivathanu helped him to complete his degree. “My mother and my brother are the sources of my inspiration. Poverty in my early age and the support given by my mother and my brother made me realise my duty to pay back to the society. In the first month of my joining Indian Railways in 1982, I decided to set apart 25% of my salary every month for the society”, says Aum Murugan with tears rolling in his cheek. Though he had to go for employment after his first degree at the age of 18 to look after his family, his thirst for higher education did not stop. He completed M Phil, 5 PG degrees, and 5 PG Diplomas from the traditional Universities through correspondence course. Currently, he is pursuing MA in Social Work, from Tamilnadu Government’s TNOU. He married Umaa in 1988 and she added value to his service to the society. She looks after the vocational training to the poor people and health camps, when Aum Murugan is in office. Their 2 children also support them in all the activities. “In the next three years, God willing, through Seva Centres, we want to provide vocational training to 5000 poor people free of cost and make them employable.”, Umaa Murugan added.